I'm still making a list of opera DVDs with which to gratify your wishes, Gentle Readers. None of the libraries in my life have the Lehnhoff Elektra (yet!) but my university has acquired the Levine/Met anniversary collection . Meanwhile, I'm working my way through the 1999 Ring from Stuttgart. I may not make a habit of watching each reviewed DVD twice, but that's what I'm doing with this set. For Regietheater the productions (each by a different director) may be fairly straightforward, but most of my opera-going life has been spent at the Met, with the consequence that I am liable to get distracted by inessential questions such as "Why does Alberich kill the rabbit?" (I'm pretty sure it's not an allusion to this.) So, without further ado, onward: where better to commence a summer of DVD-viewing than with the beginning of the world? In Joachim Schlömer's production, we don't start out in the River Rhine, but rather in Valhalla, which is an elegant Gilded Age mansion. The entire cast is on stage for the opening chords, which in this atmosphere seem ominous. They gradually melt away during the overture, but characters are often on stage when they aren't "supposed" to be, creating unexpected interactions or observations which transform or highlight relationships. Fasolt's attraction to Freia, for instance, is established before the giants' "first" entrance. (My interpretation was that it had also been spurned; according to the notes in the booklet, however, Freia reciprocates Fasolt's affection and they are cruelly kept apart by politics. I did not get this at all.) The production as a whole reads Rheingold as a drama of intrafamilial and social conflict, rather than a fate-of-the-world myth. Alberich, in an ill-fitting suit, is subjected to cruel and crude bullying at the hands of the Rhinemaidens and Wotan and Loge. The social status of Donner and Froh is uncertain; Froh could be a tennis pro. Freia has to wear high heels of oppression, while Michaela Schuster is Fricka as a businesswoman of near-caricaturish ruthlessness, intelligent and manipulative. (The element of caricature came from her aggressively unsuitable suit, not her expressive singing.) The giants are businessmen with briefcases. I'm not sure of the Rhinemaidens' social status, either--they seemed awfully pert and entitled if they were intended to be the gods' servants--but they were well-sung and fun to watch, with Margarete Joswig a wonderfully vivid Flosshilde. Brigid Brophy’s Mozart the Dramatist is, from a literary standpoint, a treat. Her fluent, sparklingly inventive prose is compulsively readable, and her frequently wicked wit is a delight. The book, thematically arranged, is not a comprehensive survey of Mozart’s “development” as dramatist. Rather, it is an impassioned and fascinating Plädoyer for his cultural significance, and an analysis of his five most famous dramas (Die Entführung aus dem Serail, Le Nozze di Figaro, Don Giovanni, Così fan tutte, and Die Zauberflöte) in light of their eighteenth-century context and in relation to Mozart’s own life. First published in 1964, I read the 1988 revision which includes a preface on Idomeneo and La Clemenza di Tito. Mozart the Dramatist boasts such tantalizing chapter titles as “Women and Opera,” “Opera, Cities, and Enlightenment,” and “Singing and Theology.” Who could resist? The scintillating confidence of Brophy’s prose does come with far fewer footnotes than I would like. Her analysis of Mozart contains a great deal of eighteenth-century cultural history, argued with great persuasiveness. The comparisons she draws are always intriguing, not least in the chapter on “The Rococo Seducer” which treats Clarissa, Les Liaisons Dangereuses, and Don Giovanni. Brophy draws on painting and philosophy to discuss the enlightenment period towards nature, science, and fantasy. She has a two-chapter consideration of Die Zauberflöte in the context of eighteenth-century interest in mystery cults, not neglecting the opera’s internal contradictions about women. (She sees Mozart as a feminist, and Pamina as an emotionally complex figure with agency. I’m less convinced than I’d like to be, but I’ll be going back to the libretto with Brophy next to me.) She also argues in some detail the why and how of Mozart’s and Jane Austen’s psychological realism. All of this I found ultimately more fascinating than compelling. It is not only her view of Don Giovanni as an “unconsciously autobiographical” work, “an eternal enigma, an unstaunchable wound in the cultural consciousness of civilization,” which is heavily reliant on Freud. There is little contextualizing or criticism of Freud himself; his categories of analysis are taken as axiomatic. Furthermore—what I found just as problematic, and more irksome—the Enlightenment is continually and insistently placed in stark, monolithic contrast to the Middle Ages. I very nearly wailed aloud at points. Because apparently the eighteenth century invented the concept of the individual, and free thought. And no one questioned the medieval belief system (singular!) which was imposed from above. Really? Just ask Thomas Aquinas about that one! Or Bede, or Boniface, or the peasant who told Jacques Fournier that the devil appeared to him in the form of a tree. This oversimplification does, I think, mar Brophy’s analysis. But it’s still thought-provoking… and it’s still a fun read. I think I have been to more Mahler within the past twelvemonth than I had previously heard live, ever. There was a bone-shaking 8th Symphony with Gergiev and the Mariinsky; Colin Davis, Bostridge, and Röschmann with Des Knaben Wunderhorn; Thomas Hampson singing the Kindertotenlieder (not blogged, but an intelligent, sympathetic, searingly direct performance); and James Levine and the Met orchestra with Das Lied von der Erde in what was, even for them, superlative form. And today, I ventured out for a concert of the New York Symphonic Arts Ensemble with songs from Des Knaben Wunderhorn and the 4th Symphony. I am glad to have gone, and very glad to have discovered the NYSAE. And I must and will praise the audience, who coughed discreetly between movements and applauded only after the conductor lowered his baton (yes! truly!) In fact, I may have been The Bad Audience Member; my concert-going companion told me that I fidgeted noticeably in the second half. Sorry. I would offer to make penance, but I think I've already been punished enough by the auditorium's seats. I admit, I was more than slightly skeptical about the premise of a pastiche song cycle of sorts. I discussed this with a nice older lady afterwards (Carnegie Hall made the evening part of their "Salon Encores" series, which gives everyone a free glass of wine and a chance to chat about the program; very nice) who confessed to similar doubts about the attempted integration of different languages, eras, and cultures into a single narrative. But in the event, Royal won me (and my conversational partner) over: she sang with passion and dramatic nuance. Ably accompanied by Christopher Glynn, she varied the pacing of transitions between songs, as well. Sometimes she paused to savor expectation or satisfied longing; at other times the intensity of passion hurtled us from one vignette into the next. One such change made for one of the evening's most successful moments: a breathless transition from Hugo Wolf's "Erstes Liebeslied eines Mädchens" into Schubert's "Gretchen am Spinnrade." Oh yes, she did. 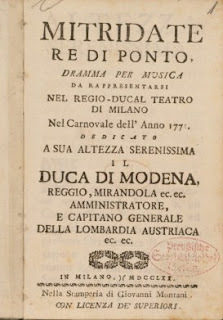 Mozart's first opera seria, Mitridate, Rè di Ponto was first performed in 1770; according to Stanford University's OperaGlass, no revivals are known to have taken place before the twentieth century. The run now beginning at Little Opera Theatre of New York marks its first full staging in this city. For fuller information on the production and participants go here; for a nice introduction to the piece, and a little background on Mozart's operas in New York, see this article by Fred Plotkin. The libretto and score are available online. According to Jörg Krämer, Mitridate was the opera which, using the highly respected opera seria form, established Mozart as a force to be reckoned with, a Berufskomponist rather than a Wunderkind. Wednesday's performance certainly showed off Mozart's gift for expressive melody; the opera's emotional insights sometimes seem to be achieved against the contrivances of the plot, but there is much both to appreciate and to ponder. Well, Gentle Readers, on the academic and opera-house calendars, summer is here. As a budding academic, I'm thrilled: three months to focus on my work! (Don't laugh. At least, don't tell me you're laughing. Thanks.) As an opera-goer, I am in mourning; my grad school stipend doesn't really stretch to travel for summer festivals. Although, if there is something absolutely amazing that you think I mustn't miss, to which public transit will take me to from NYC, do let me know. I'll count my pennies. So, Gentle Readers, I seek your advice. What should this blog do with itself over the summer months? I do, of course, have the Met's free concerts and the Mostly Mozart festival and a handful of other things on the calendar. Operamission has a number of summer events, as well. But I want more, and this is where you come in. Tell me what I should do, see, listen to, and read! If the NYPL has an opera DVD or book, it can be mine (and I've already ordered a brace of memoirs from Amazon's German site... stay tuned!) As for events in the city, I will spread my budget as far as it can go... and, schedule permitting, review anything for the price of a comp ticket (ahem.) Don't be shy, Gentle Readers: tell me what you'd like to see here, and do feel free to expand on this in the comments section. What should this blog feature this summer? My mother, lord love her, has long regarded--and listened to--my opera obsession in more or less suffering bewilderment, or more or less bewildered suffering. More than one broadcast was curtailed by a long-suffering maternal: "Darling, can you turn the screaming off?" In a brave spirit of zeal for wider experience, though (and for understanding her crazy daughter,) she has come to the opera with me before: to Cenerentola, known as "the pretty one," to Turandot, "the elaborate one," and, now, to Walküre. After Turandot, I had promised that we could go to a show on her next New York visit, and I wouldn't make her try opera again. How I got from there to loaning her my handkerchief during Wagner is a story which I offer not only for your entertainment and edification, Gentle Readers, but also for your consideration as a case study in opera audience development. Because I am, now, allowed and even encouraged to get her to try this opera thing again, as long as it's a "nice, dramatic one" like Walküre. This has been a good spring for Strauss at the Met. After a luxurious Capriccio, we get Ariadne auf Naxos with an incredible cast under the baton of Fabio Luisi. Luisi's passionate, precise conducting was a joy, evoking the disparate characters of the prologue's bustling drama, and opening out into glorious, sweeping lyricism when this was called for. I'm not an Ariadne-expert, but I thought the orchestra was appropriately knowledgeable and gently ironic as well. (Parenthetically, I was seated between a lady who knows the opera backwards and loves it passionately, and the personal trainer of one of the cellists, who was hearing it for the first time. We all loved it.) Elijah Moshinsky's production--pictures from previous runs here and here--I thought very successful in the prologue. The opulence of the house was established, there was not-too-broad comic business for the Tenor and Prima Donna, and a detailed treatment of both relations within the comic troupe and the group of musicians, and the increasingly hostile relationship between the factions. I wasn't entirely sure how much of the opera staging was supposed to be taken seriously; it seemed to me that Moshinsky was choosing to amplify its ambiguities, rather than interpret them. I did like the treatment of the constellations and the presentation of Najade, Dryade, and Echo, but I thought the opening up and closing of various layers of cloud backdrops got to be a bit much. Still, the finale was musically glorious. It ain't necessarily so. Bryn Terfel is, however, an extraordinarily chameleon-like performer, whose unmistakable timbre is used on his latest CD to evoke a remarkably diverse cast of unsavory characters. I treated myself to Terfel's Bad Boys CD in the holiday mood inspired by the unexpected chance to hear his Scarpia last month; I've been enjoying it as much as I had hoped. What I had not expected was for listening to it to be a feel-good experience. It is impossible for me to hear Terfel's Dulcamara brazenly charming Donizetti's rustici without doing a little dance step around the apartment. "When the Night Wind Howls" from Ruddigore is simply a treat (and I think it would be even if I did not have a sentimental fondness for the piece, which I tried to make my father teach me by rote when I was about seven.) Even in the portentous finale of Don Giovanni--sung by Terfel, Terfel, and Terfel, with the help of good sound engineering and great voice characterization--Leporello draws a chuckle. In Terfel's hands, the Devil--whether from Gounod's Faust or Boito's Mefistofele--is a perfect charmer. By the piano of my ancestral establishment lives a two-volume collection of German folk songs, and in that collection is a special section for Mailieder. I am wildly in favor of having an entire genre of songs devoted to May, and its traditionally associated joys of sunshine, going for long walks, and falling in love. Here is my favorite of these songs, "Der Mai ist gekommen."